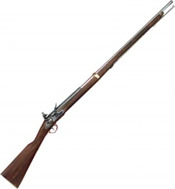 Our Collection of museum quality western replica rifles includes western 1866 lever action rifle, Henry repeating rifle, French carbine, Kentucky flintlock rifle, English flintlock rifle, Lucas McCain Rifleman rifle, brown Bess, blank firing lever action rifle, Enfield, sharps carbine, percussion revolving rifle, M1873, M1892, lever action carbine, miniature lever action rifle. These are great for display, collecting and western shoot out reenactments as well as movie and stage props. Great western gun collectors gift idea.